This vehicle was new to City of Cardiff Transport in 1964 and is now owned by Cardiff Transport Preservation Group having been donated to them in 2008 by the National Museum of Wales. 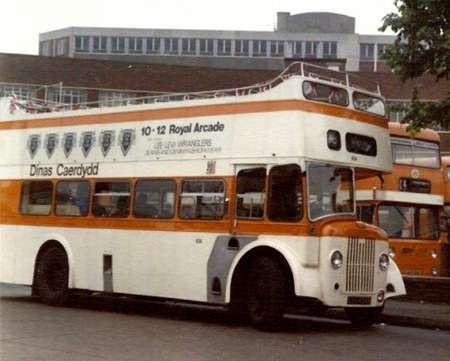 One of 12 Guy Arab V’s fitted with Neepsend rear entrance body it was converted to open-top by Cardiff in 1976 for use on city tour duties along with similar bus 424 which is preserved in Essex . 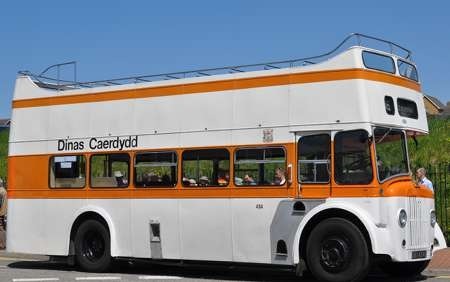 It is seen in service at the Barry Island event in June 2013. 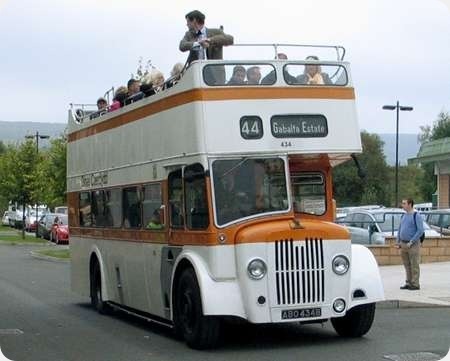 Following its appearance at the Rally, ex-Cardiff 434 was selected to appear at the Rhiwbina Festival (Rhiwbina is a suburb on the northern edge of Cardiff). A lady approached a couple of us who were there with the bus and asked ‘Is this a Guy?’. When we confirmed that it was, she told us that her father had worked for Guy Motors and that she had some photos and documents. Would we like to see them? We most certainly would! She has now sent me the attached scan of a photograph of Burlingham-bodied Guy coach (28 RRF – or is it 29 RRF? – no. 51 in the Harper of Heath Hayes fleet, very similar to the preserved one that appeared at last year’s Newbury Rally. The lady tells me that her father was George Edgar Harris (b.1917, d.1980), and that he was appointed manager of the export sales department at Guys in 1948. He was appointed to the board of Guy Motors (Pty) Ltd in 1957, and was a director of Guy’s parent company from January 1958 to about 1960. The photograph appears to have been taken during a visit by several potential Guy customers from far and wide to the fleet of a regular buyer of Guy Motors products. As a postscript, I attended the Llangollen Railway’s Classic Transport Weekend on Saturday and was delighted to see ex-Chester Corporation (and now resident of the North West Museum of Transport) Guy Arab IV/Massey arriving to take up its position as one of the three buses on the Glyndyfrdwy-Corwen run. A notice above the front windows upstairs highlighted that it’s now celebrating its 60th birthday. It ran on the service in fine form and is a credit to all concerned. 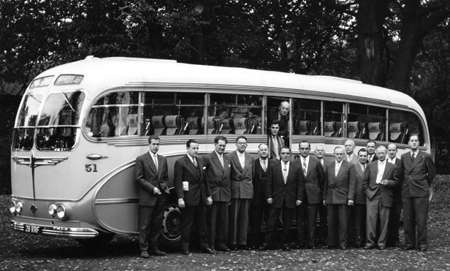 I should mention that the bus in my photograph (the one you submitted to the website, “old-bus-photos”), is almost identical to a bus in a photograph on page 79 of Robin Hannay’s book, “80 Years of Guy Motors Limited”. The two buses look as though they belong to the same fleet. They both bear the name “Harper”, but the bus in my photo has the number 51 painted on it, and its number plate is 28 RRF, while the numbers of the bus in Robin’s photo are 52 and 27 RRF respectively. Robin’s photo was taken in 1960, and his bus looks more dilapidated than the one in my photo, which I believe was taken in 1957! Something about this Seagull has struck me as "wrong" – it just doesn’t look "right" from the front . . . but I’ve not been able to put my finger on it. Until now – I just leaned back at my desk and noticed the OOC Wallace Arnold Seagull in the display cabinet above my desk: the headlights are normally above the front beading, with any spot/fog lights beneath – here they’re mounted much lower down at the same level as the spot lights. According to the new Burlingham body list published by the PSV Circle (B1002) the Guy is thought to be the very last Seagull Mark III.